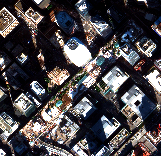 Shadows cast in remote sensing images complicate their analysis due to the low contrast in the poorly illuminated image regions. Shadow removal/compensation methods aim at automatically reducing shadow effects, either by a physical or learning-based model. The goal of this work is to explore and examine methods that can be used to automatically enhance shadow regions in satellite images. V. Kwatra, Mei Han and Shengyang Dai, “Shadow removal for aerial imagery by information theoretic intrinsic image analysis,” 2012 IEEE International Conference on Computational Photography (ICCP), 2012.